Could your students inspire the engineers of the future? Teaching physics is not necessarily the first thing that comes to mind as a career for an engineering graduate. However, it is a rewarding, valuable and important occupation and engineers make excellent teachers. 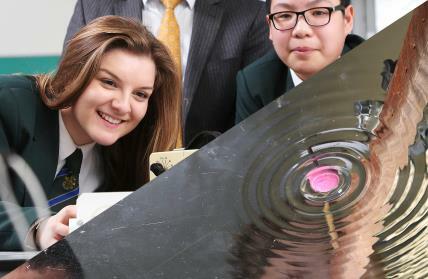 Specialist physics teachers play a vital role in the classroom to nurture, educate and guide the next generation of engineering and physics graduates. The UK needs a two-fold increase in the number of engineering graduates if it is to meet demand for 1.28 million new STEM professionals and technicians by 2020 (EngineeringUK). This can only be achieved if we increase the pool of potential undergraduates by encouraging more – and more diverse students – to take physics A-level. The evidence is clear that the single biggest influence on students’ choice of subjects is the quality of their teacher. Currently, there is a chronic shortfall of specialist physics teachers with a good background in school-level physics; so, to increase A-level numbers, the system needs more specialist teachers. An engineering degree equips students with all they need to become a great specialist physics teacher. They have the subject background, they are good communicators and they can relate the content of physics courses to engineering contexts – capturing the imagination of students and exemplifying for them the experience of studying engineering. The Institute of Physics is offering 150 scholarships to individuals with the background and enthusiasm to be exceptional teachers of physics. Each scholarship is worth £30,000 tax-free funding, as well as a package of support which includes networking events, mentoring and IOP membership during your training year. We can also offer school experience placements if they would like to inform their choice. There is more information about teaching at www.iop.org/engineerteach. Please do encourage some of your undergraduates to consider becoming a physics teacher. Doing so is an investment in the future and in the next generation of engineers. I work for a small family run Engineering company. We do take on Engineering grads but don’t seem to be able to hold onto them for more than a few years which is a big shame. I have asked the last two who have left why they feel the need to move on so soon. Both said they were encouraged to build up their employment portfolio in their first five years after leaving uni .